The Latest IBPS RRB Office Assistant Recruitment Notification 2017 released. Aspirants of bank jobs should apply for the ibps.in RRB Clerk Jobs vacancies 2017 before the last date. Get the details of Regional Rural Bank Recruitment for Office Assistant from the IBPS RRB Office Assistant Notification 2017 available on this page. Keep reading the post and get complete information on the Group B Office Assistant (Multipurpose) Vacancies. Latest update: IBPS RRB Apply Online link for Office Assistant will be active from 24th July 2017. Hurry up and apply for IBPS RRB Office Assitant Exam 2017 on or before 14th August 2017. The Institute of Banking Personnel Selection will come up with the latest recruitment notification for Office Assistant Posts. This time, the number of Regional Rural Bank Clerk Vacancies is really high. According to the notification, the number of vacancies available under this IBPS RRB Office Assistant Recruitment 2017 is 7374 posts. The notification also displays the important dates like the application starting date, last date, preliminary, mains exam dates, etc. So, all the candidates who are aspiring for the bank jobs should now click on the IBPS RRB Apply Online link. In the below sections, we provide you the links to download the IBPS RRB VI 2017 notification and application forms here. So, the candidates can search the selection process, syllabus, application form, exam pattern, etc nowhere. The notification under the IBPS Regional Rural Bank Recruitment 2017 is for office assistant (multipurpose) or clerk jobs. Coming to the role of a clerk job, the candidate will be interacting with the clients, provide queries. 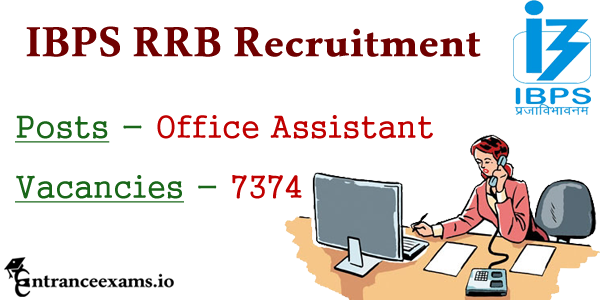 So, if you are interested in this RRB Office Assistant Posts 2017, then start to apply before the last date. A very important point to remember is that only the eligible candidates should apply. Generally, all the intermediate and graduation completed candidates are eligible for the IBPS RRB CWE 6 Exam 2017. So, check the other eligibility criteria for the RRB Office Assistant Examination 2017 in the following sections. The candidates willing to apply for the IBPS RRB Office Assistant Recruitment 2017 should possess the following criteria. Since the department of Institute of Banking Personnel Selection will accept the applications from only the eligible candidates. Check out the details of ibps.in RRB Office Assistant (Multipurpose) Exam eligibility here. The applicants should have a Bachelor’s degree in any discipline from a recognized institute or its equivalent qualification. He/she should have the knowledge of the local language prescribed by the participating RRBs. Applicants of the IBPS Regional Rural Bank Clerk Jobs 2017 should have the following age limit set by the Institute of Banking Personnel Selection. General Category candidates – 18 years to 28 years. For OBC candidates – 18 years to 31 years. SC/ST category candidates – 18 years to 33 years. Age Relaxation for the reservation categories is as follows. SC/ST category – 5 years. OBC category – 3 years. PWD Category – 10 years. The candidates who are applying for the Regional Rural Bank Office Assistant Vacancies should be a citizen of the following regions. Along with the eligibility criteria, you can find the pay scale, application fee, important dates of IBPS RRB VI recruitment notification 2017 here. Read the following section for more details. SC/ST/ PWD Candidates should pay an application fee of Rs.100/-. General and OBC Candidates have to pay the fee of Rs.600/-. The candidates should pay the fee through net banking, debit card, credit card, etc. The department of Institute of Banking Personnel Selection will select the candidates according to their performance in the selection process. It will conduct the following IBPS RRB Clerk Recruitment procedures. IBPS RRB 2017 Office Assistant Preliminary Examination. The candidates who are shortlisted in the IBPS RRB Clerk CWE VI Recruitment 2017 will get a handsome pay scale according to the rules of the department. The Institute of Banking Personnel Selection will offer the selected candidates, a salary of Rs. 15,000 to Rs,19,000/-. Visit the official site of Institute of Banking Personnel Selection to apply for IBPS RRB Office Assistant Recruitment 2017. Click on the CWE RRB’s tab on the home page. Then click on the Regional Rural Bank Phase VI link. Before applying, complete the online registration process. Now login with your credential of registration ID and password. Fill in the IBPS RRB Multipurpose Office Assistant Application Form 2017 carefully without any mistakes. Upload the scan copies of the essential documents and photographs. Complete the RRB Office Assistant Application Fee payment in the prescribed format. Save the copy of the form for future use. The Institute of Banking Personnel Selection will conduct the preliminary and mains examination on the mentioned dates. So, the candidates going to attend these IBPS RRB Clerk Prelims Exam and Mains Exam must know the exam pattern. We provide the exam patterns for the individual examinations here. No of questions – 80. Total Duration – 45 min. Check the complete details of Pre Exam Pattern and Mains Exam Pattern from the official notification. Or just click the link provided below. The candidates appearing for the Regional Rural Banks Recruitment CRP VI Exam should know the syllabus beforehand. This helps them know the topics that they need to cover in their preparation. So, we have provided the ibps.in RRB Group B Office Assistant Prelims Syllabus and Mains syllabus here. After completing the Clerk online registration process, the candidates should download the IBPS RRB Clerk Admit Card 2017. The Institute of Banking Personnel Selection will release the RRB Clerk 2017 Admit card @ www.ibps.in 15 days before the exam. You can get the links to download the Prelims and Mains Exam Call Letters on this page. Once the IBPS RRB CRP Exam for Office Assistant Posts is completed, the department will release the results in the month of October tentatively. Prior to the results, the department will announce the IBPS RRB Clerk Cut Off Marks for the CWE VI Prelims and Mains exam. However, you can check the qualifying marks on our site entranceexams.io when the official links come out. In line with the notification, the tentative dates for the Regional Rural Bank Office Assistant Preliminary Results will be out in the month of October. Similarly, the mains examination will be on November 12, 2017 which means the results will be out in the month of December. The final merit list will be displayed on the official site of Institute of Banking Personnel Selection. The candidates appearing for the Common Recruitment Process of Group B Office Assistant (Multipurpose) vacancy can get the IBPS RRB Clerk Previous Year Question Papers here. This will help you know the type of questions that will appear in the examination. So, visit our page and get the RRB Office Assistant Previous year papers pdf.